Fresh off an impressive 3-0 run in the 2018 Paradise Jam and winning the Island Division Championship, the newly ranked Kentucky Wildcats looked to keep their momentum going and improve to 8-0 with a win over in-state opponent Morehead State. Three minutes into the game, Rhyne Howard was already hot from beyond the arch, knocking down two threes and putting Kentucky up 7-0 early. Morehead State scored the next five points, but the Cats answered by going on an 11-0 run to lead 18-5. A tipin by Taylor Murray and a foul on Morehead will sent Murray to the line to extend the lead. Early on in this one, Howard lead Kentucky with eight points and four rebounds. Maci Morris was right on her heels with six points of her own. Before the end of the half, MSU used a 7-2 run to cut into the UK lead, but the Cats would lead 26-14 after 10 minutes of play. Kentucky hit 10 of its 16 shots (62.5 %) from the floor in the quarter. The second quarter belonged to Maci Morris. 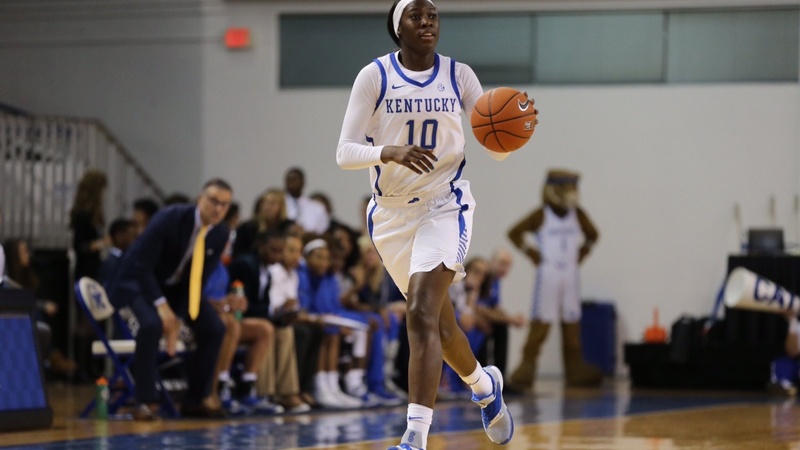 She hauled in 19 points, bringing her total to a seaosn high 25, inclduing all nine points from a 9-2 UK run and a last second three as the half ended. The nine point run by Morris gave the Cats a 35-17 lead with 6:40 remaining. Not long after, Taylor Murray knocked down a three to give Kentucky a commanding 40-19 lead. The half ended wiith a 12-4 run, led by Morris, for Kentucky to take a 29-point lead into the break. At the break, Morris lead the team with 25 points and three rebounds. Howard was right behing her with eight points and four rebounds and Taylor Murray added seven points, one rebound, two assists and two steals. The Cats took control of this one in the second quarter and entered the break with a commanding lead. Coming out of half-time Kentucky was cold from the field, hitting just two of its first seven shots. However, the Wildcats were able to extend their lead by converting eight-of-eight at the free throw line, including four straight by Jada Roper. Kentucky would then go on a 12-3 run to extend the lead to 68-33. Overall, UK would outscore MSU 22-12 in the period. The Cats combined for 10 steals and 25 rebounds - nine offensive, sixteen defensive. Kentucky ended the quarter on a 12-2 run. After three, Kentucky has 32 points off turnovers and a 39 point lead. Morehead State opened the fourth quarter on an 8-2 run, hitting four of its seven shots from the field, while Kentucky missed its first two shots and committed a pair of turnovers. Four Wildcats ended in double-figures; Morris (31), Howard (17) Murray (13), Roper (10). No. 25 Kentucky forced 25 turnovers vs. Morehead State, scoring 38 points off those miscues. The Wildcats would score six straight to take their largest lead, 82-43 before MSU closed the game with a 14-5 run. Kentucky improves to 8-0 heading into December. They face Rhode Island next Thurday at either 7:00pm or 9:00pm on SEC Network+.